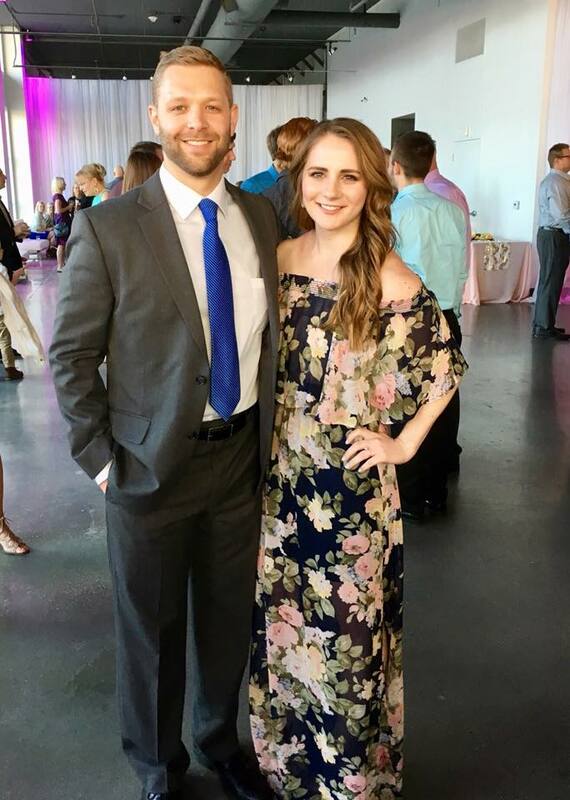 Rent the Runway is a company that you are probably familiar with for the service of renting dresses for special occasions. (At least that is how I always thought of them!) While Rent the Runway does have a reserve service where you can rent an item for a specific occassion and pay only for that item, they also have two different subcription services. The first is Rent the Runway Unlimited, which is $99 for your first month of unlimited rentals where you get 4 pieces at a time. The second is Rent the Runway Update, which is about $70 for your first month where you get 4 pieces to keep for a whole month. I have actually tried both but today I'll be reviewing Rent the Runway Unlimited. If you sign up under my link for Rent the Runway you will get $30 off your first order as well as I will receive a credit to Rent the Runway. Keeps you from getting bored with your wardrobe or feeling like you have nothing to wear -- get to wear new outfits all the time! Items included in the unlimited options could be $80 (for example) on their own for a rental for 4 days. For that price it's worth it to a month of unlimited and get more clothing throughout the month! All of the items I rented during my RTR Unlimited membership are linked in the widget below if you would like to see what all I got during my month! As soon as you are done with an item, you can mail it back using a prepaid label. 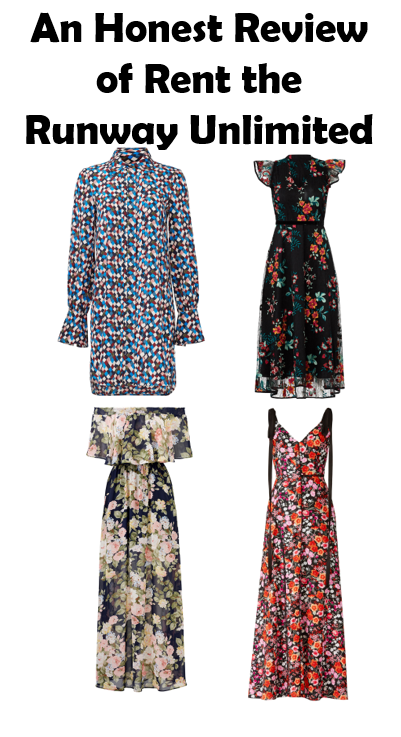 However, you are not able to order your replacement item(s) until Rent the Runway receives it. While I understand why they do this, it is really unfortunate the amount of time you lose to shipping. If I dropped off a package for mail on Thursday, I wasn't able to order my new items usually until late Monday/Tuesday. From there it took another two days to get my new pieces, so altogether the return/pick out new items process took about a week. When you hear unlimited you think you'll be able to get new items constantly and it's really not the case. My hope would be that in the future you are able to mark the items you've returned online so that as soon as your return is dropped off, you can place an order for your new items. If you live in a city where there is a RTR location, you can do this whole process in store so you save on the shipping times! If an item doesn't fit, you're out of luck. While yes, you can return it and pick out a new item, this takes 7 days. Because of the return length, sometimes I wore items I didn't really like just to get some wear out of them. You have to fill all 4 of your rental slots, which means that if you return two items as soon as RTR receives them, you can place your next order. However, if only 1 item is available that you really want you can't just order that 1 item. So, you can risk waiting an extra day to see if item 2 you want comes in, but then you may lost out on item 1. Or, you go ahead and order the 1 item you really want and something else random just to get the order to go through. This was frustrating as I was holding out for 2 dresses to come in stock for the weddings we had to attend. One showed up and I wanted to order it to reserve it, but wait a day or two to see if the second dress became available. This wasn't an option, so I just ordered the dress that I wanted that was available and picked something else that was OK but not my first pick. You can return 1, 2, 3, or 4 items at a time. While this is nice as soon as you make the return you don't have the garment bag anymore to return in. you have to wait for your next items to arrive before you can return the rest of the items. So if you return two items on a Wednesday and then by Sunday you are ready to return the next two, you have to hold on to them until your next order arrives. Like I mentioned above, if you sign up under my link for Rent the Runway you will get $30 off your first order as well as I will receive a credit to Rent the Runway. This post is not sponsored and is my honest opinions. If you have any questions, please leave a comment or send me an email! All of the items I was able to rent during my month of unlimited are linked in the widget below. A trip to Banff has been on my bucket list for a few years now. Luckily, as soon as I showed Tyler pictures of the beautiful blue water and mountains he was on board. We took a trip there from July 18-26 and had the most amazing time. I would recommend it to anyone and we would LOVE to go back one day. 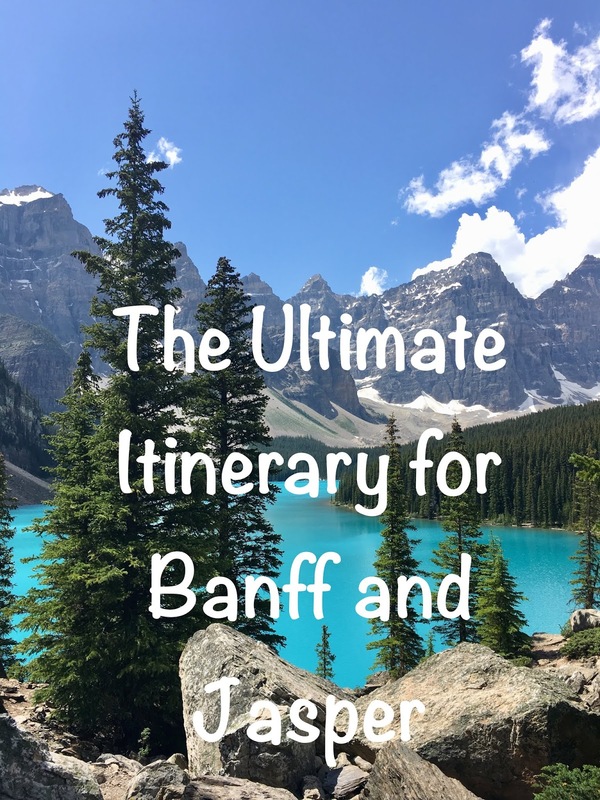 Below is our complete itinerary, but I will also be writing a second post with my lessons learned from our trip to Banff. If this isn't on your bucket list yet -- add it ASAP. Day One: The first day of our trip was a travel day. We actually were able to work a half day and took a late afternoon flight out of KC to Seattle. We landed in Calgary around midnight and then took a shuttle to our hotel. We stayed at the Homewood Suites Airport. It was a nice hotel and I would recommend it if you have a late flight into Calgary. Day Two: After we had breakfast at the hotel we hopped back on the airport shuttle to pick up our rental car. We had planned to spend the day exploring Calgary, and had booked a second night at the Homewood Suites. However, once we got there we were anxious to get the mountains and ended up driving to Canmore to spend the day. Canmore was about an hour and fifteen minute drive from Calgary. We had lunch at Rocky Mountain Flatbread Pizza (one of our favorite meals from the trip) and walked around their downtown area. Downtown Canmore had a lot of shops that were fun to explore and a farmer's market going on while we there! After shopping, we decided to go walk the Bow River Loop. We weren't really dressed for hiking so a simple walk along the Bow River was perfect! The loop takes about 30 minutes to complete and follows a trail along the river. After a short walk we decided to check out Canmore Brewing. 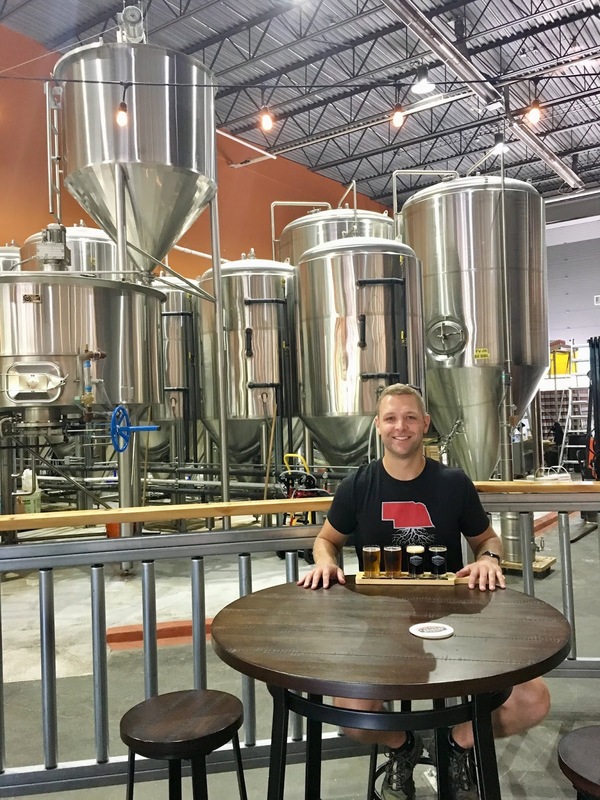 Neither Tyler or I were overly in love with the beer, but it was a fun place to check out because you can sit and enjoy their beer right in their brewery room where they make the beer! After checking out Canmore for a little while longer we made the drive back to our hotel in Calgary. (This is not ideal and I would not recommend it. More on this in my lessons learned post.) In Calgary we grabbed a quick bite to eat and went to bed early so that we could hit the road to Banff bright and early the next day. Day Three: We started our day with another breakfast at the hotel and then got on the road to Banff! We decided to head straight to Moraine Lake and get some hiking in right away. As soon as we got to the lake I was in complete awe. Pictures just do not do this place justice! It is SO SO beautiful there. I felt like I had stepped straight into a postcard. When we got to Moraine Lake the first thing we did was the Rockpile Trail. This is a super short hike (.8 km) with the most amazing views of the lake. Most of the pictures you see of Moraine Lake are probably taken from this viewpoint. We spent quite awhile up there just enjoying the views, eating a quick snack, and taking lots of pictures! After, we decided to hike the Consolation Lakes Trail. This mostly flat trail is 5.8 KM through a forest that opens up to rocks and pretty blue lakes. We enjoyed this hike as it was nice to get away from the crowds and we had fun climbing all over the large boulders to get to the lake. The forest to get to the lake is also really pretty, making the whole hike super enjoyable. That being said, it doesn't have any views of Moraine Lake so if that's what you're after you can skip this one. After this hike we got a bite to eat at the Moraine Lake Lodge and walked around the shoreline trail, enjoyed watching people canoe, and took in the view. At the end of the trip we both agreed it was the most beautiful lake we saw. At this point, we still hadn't checked into our AirBnB so we decided to head into Banff to check in. We stayed in an AirBnB that was within walking distance to downtown Banff and it was perfect! Such a great location and we were easily able to walk to dinner/shopping. After getting some groceries for our trip and showering, we headed into downtown Banff for dinner. That night we ate at Eddie Burger + Bar. We shared an order of poutine (a must try at least once during your trip to Canada) and a burger. Day Four: This day was one of our favorites! 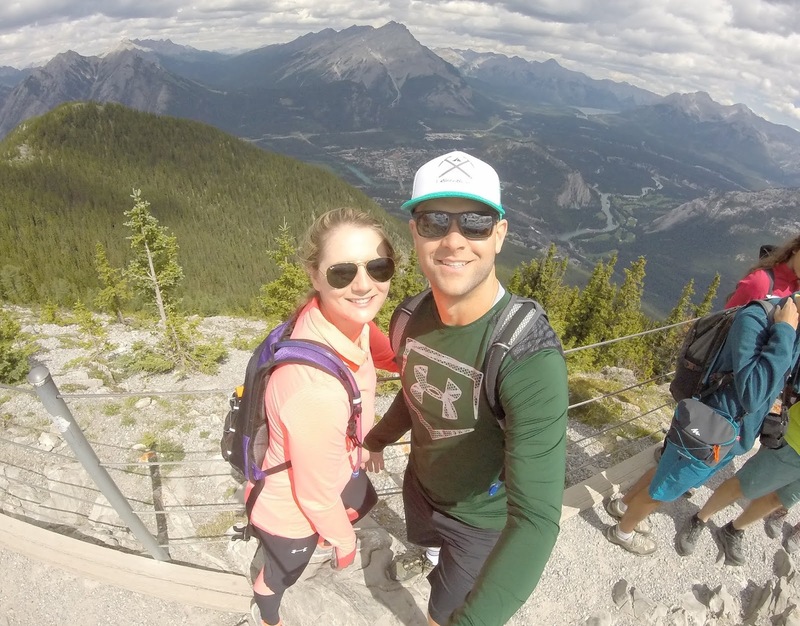 We decided to hike Sulphur Mountain, which was actually a pretty steep and difficult hike. This is 10.1 KM hike that zigzags back and forth up Sulphur Mountain. 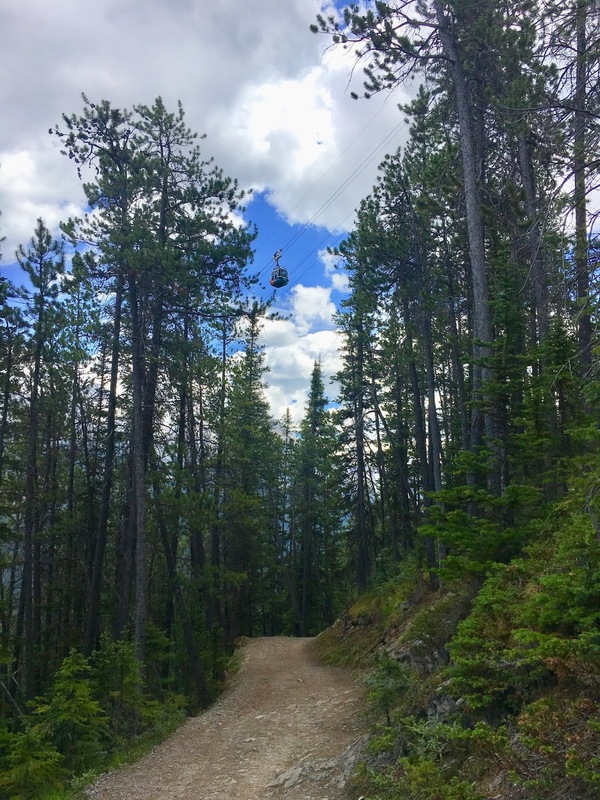 It is very rewarding when you get to the top because this is the mountain the Banff Gondola goes up! Even though we were exhausted when we got to the top we felt so proud because we were able to hike a mountain that other people ride to the top. Because the top of the mountain is where the gondola stops, the top of Sulphur Mountain is crazy busy. There are people EVERYWHERE and it is kind of overwhelming after the peace and quite of your hike. Once at the top you can walk through a gift shop, grab something to eat, explore the Cosmic Ray Station, and more. If you are there early, you can take the gondola back down for free but if you are hiking up later in the day (I believe after 9 AM) you have to pay a fee for the gondola ride. Personally, I don't think it's worth the money to pay and the way down is the easy part! Sulphur Mountain trail starts at the same spot as the Banff hot springs so we decided to reward ourselves with a visit to the hot springs after we finished the hike. It had great views and was a nice way to relax our legs after a day of hiking, but after 30 minutes we were ready to go. 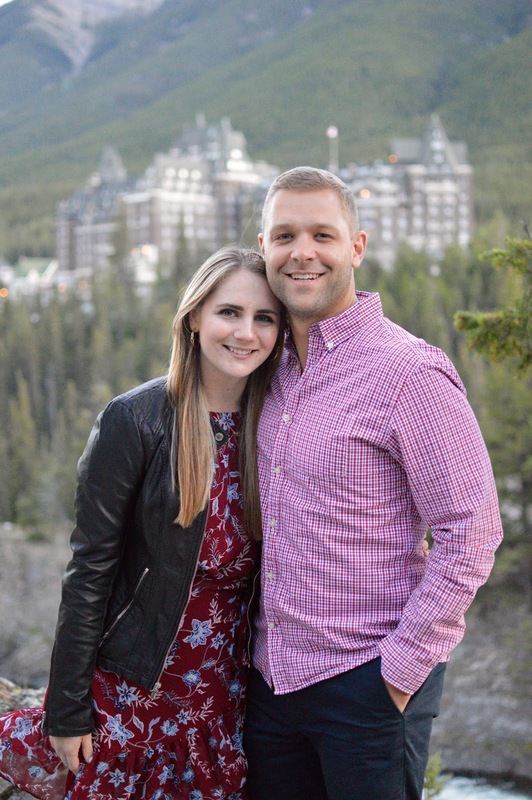 The night we ended up going to explore the Fairmont Banff Springs hotel which is an absolute must on your trip! 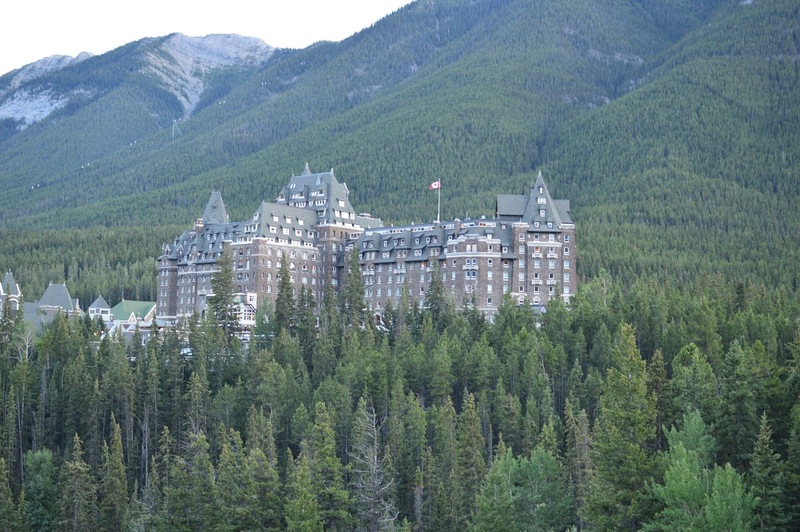 You have probably seen pictures before, but it is a gorgeous hotel that has been nicknamed the "Castle of the Rockies". We started with dinner at the Waldhaus Pub and Patio which is right on the golf course grounds of the hotel. 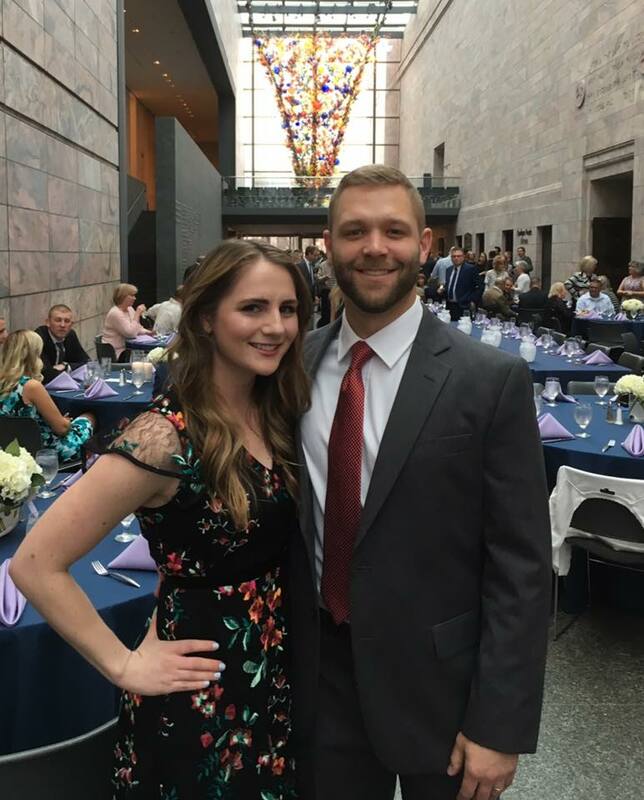 We were able to sit outside and enjoy the views throughout dinner! 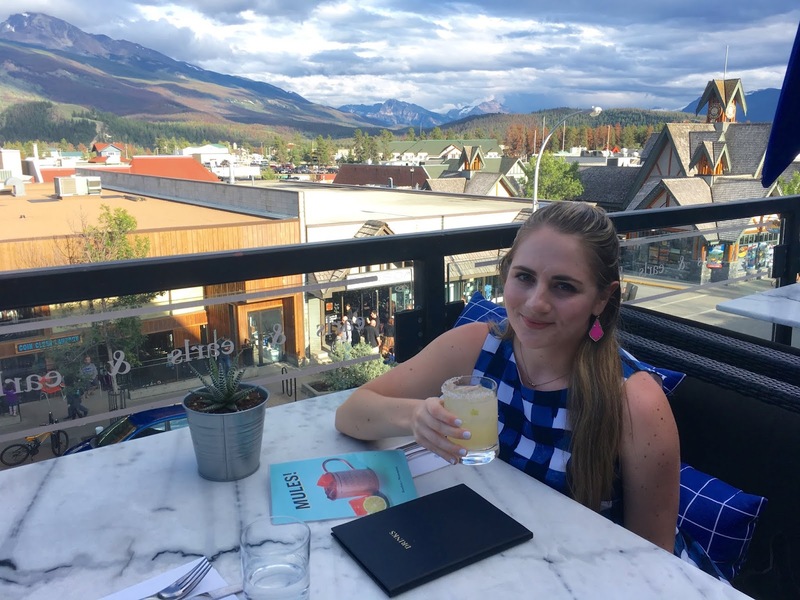 The food was just OK -- I probably wouldn't recommend eating there to anyone but would definitely say to grab a drink on the patio and enjoy the views! After dinner we walked around the grounds of the hotel and then drove over to Surprise Corner for some pictures/views of the hotel! Surprise Corner is the best place to go to get views of the hotel. Surprise Corner is clearly marked and easy to get to (they have a parking lot and dedicated viewpoint) and is only a 5 minute drive from Downtown Banff. Day Five: Day five was dedicated to Lake Louise and was my most favorite day from the whole trip. Lake Louise is stunning! We did the Lake Agnes Trail and hiked to the Lake Agnes Tea House. On the way to the Lake Agnes Tea House you will also stop at Mirror Lake which is a great spot for relaxing and taking pictures. We bought our own food and just enjoyed the view before continuing on to the Big Beehive Trail which was AMAZING. The views here are unreal. It's a beautiful view of Lake Louise and Chateau Lake Louise. We kept a pretty fast pace but definitely enjoyed relaxing at each viewpoint so all together it took us about 5 hours. After hiking we walked through the Chateau Lake Louise and did some shopping. That night we went out to dinner at Coyotes Southwestern Grill. We were in the mood for some Mexican food and it did not disappoint! Day Six: Day six we drove the Icefields Parkway to Jasper. 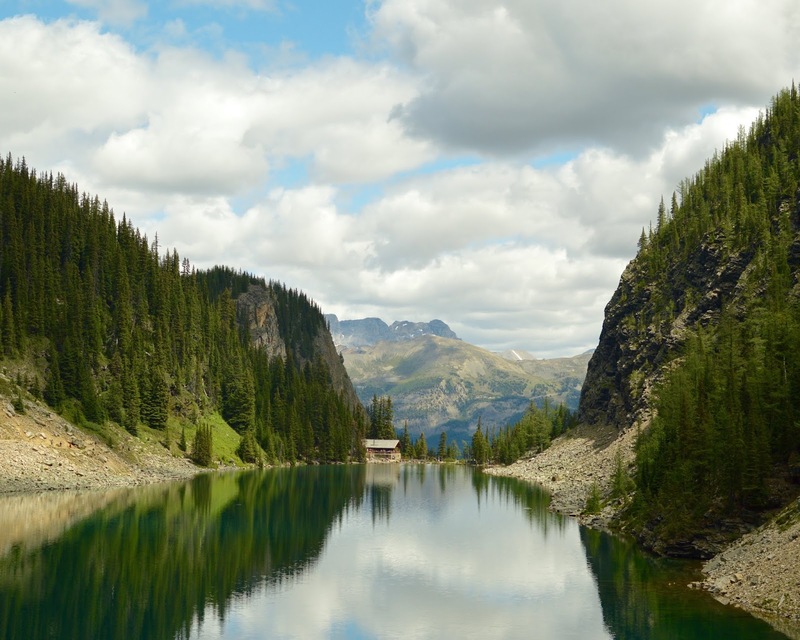 The Icefields Parkway is known as one of the most scenic drives in the world. If you don't stop at all the drive is three hours and thirty minutes but there are so many places you're going to want to stop while making the trip! There are countless turnoff points for views, hiking, exploring glaciers, waterfalls, and more. We stopped at the Sunwapta Falls first. 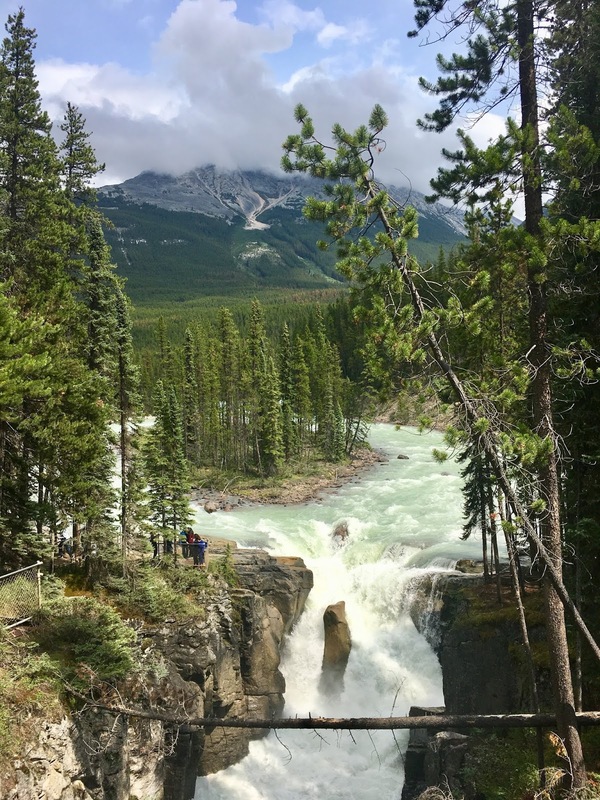 Sunwapta Falls is a pair of waterfalls of the Sunwapta River. It is so beautiful there and definitely worth the stop! After a stop there we continued on to the Athabasca Falls. Pictures here truly do not capture how beautiful it is. The falls open into the Athabasca River and when we were there people were starting to go out on a white water rafting excursion. We got to see three different rafts go out so that was really fun to see! Next, we continued on into Jasper and did the Old Fort Point trail. Our legs were honestly so tired after the previous two days so an easy day of driving and an easy hike was so needed. This is a great hike when you're short on time and want something easy. It has great views of Jasper, too! Once we finished hiking we checked into our AirBnb and got ready for dinner. We went to Earls for dinner and it was hands down my favorite meal of the entire trip. We got to sit on their upper patio so the views were amazing! I had the quinoa avocado powerbowl with chicken and it was delish. It was also Margarita Monday so margaritas were on special. It was such a great place and if you stop in Jasper you must go there! Day Seven: When we woke up on day seven we went out to breakfast at LouLou's before heading to Maligne Lake. Tyler and I both agree that this was our second favorite day of the trip. 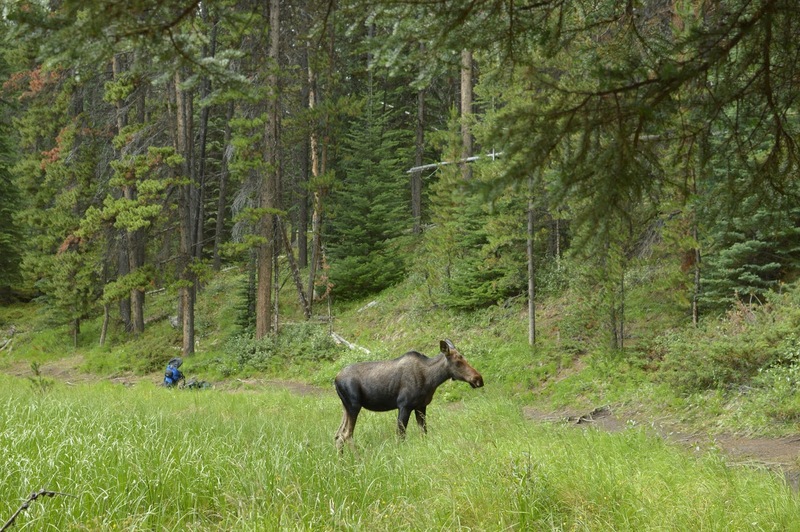 We did the Moose Lake Trail first and actually got to see a moose up close! After the quick hike, we rented a canoe which was AMAZING. We rented a canoe for an hour for $60 and had the best time being out on the water. 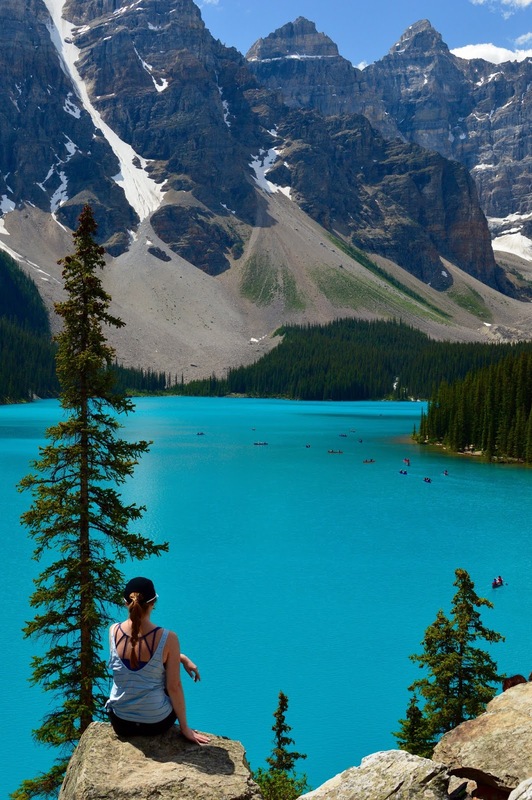 You can rent a canoe at Moraine Lake and Lake Louise, but it is more expensive and while we were at those lakes we had a lot of hiking we wanted to do. 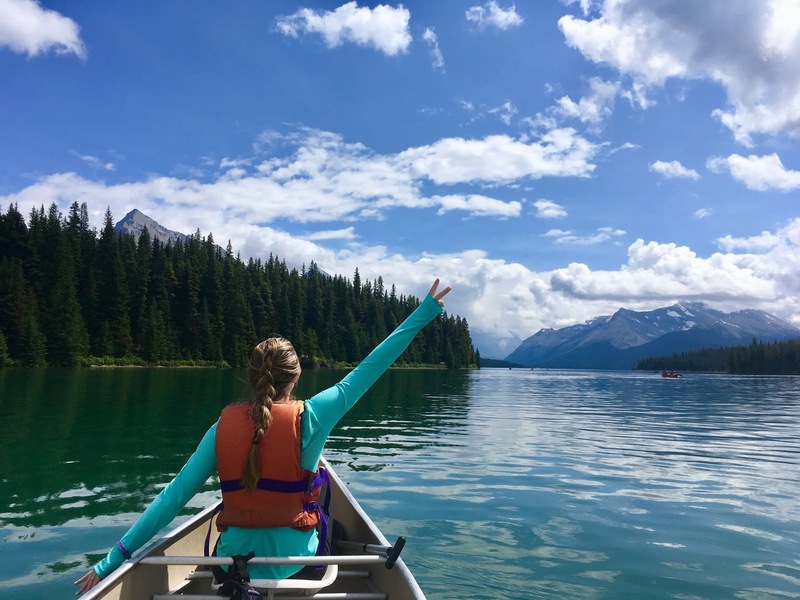 It was nice to rent one at Maligne Lake because it was less busy and the hikes we were doing there were shorter so we had time to both hike and canoe! It was amazing and I would 10/10 recommend renting a canoe if you find yourself in the Canadian Rockies one day. 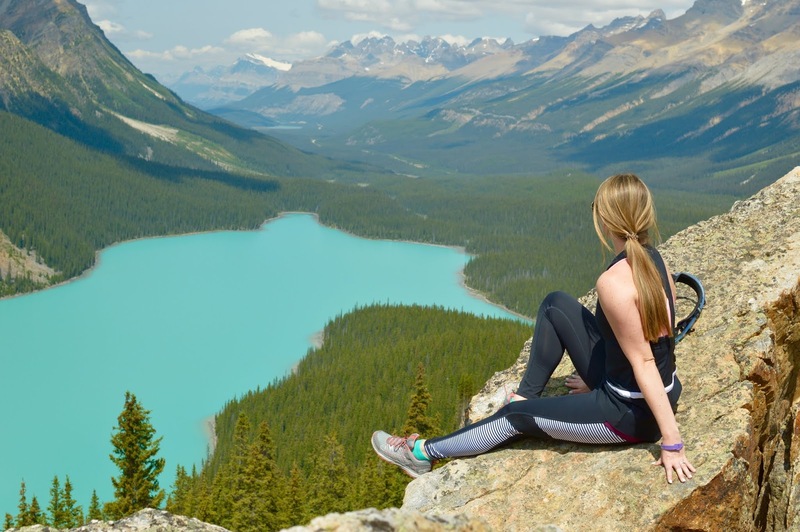 Before leaving Maligne Lake we also completed the Mary Schaffer Loop Trail which was an easy hike around the lake. That night for dinner we went to the Jasper Pizza Place. The food was excellent but the service was honestly not that great. Day Eight: The next day we made the drive back to Calgary. We drove the Icefields Parkway again and enjoyed the amazing views. Even though its 3+ hours before you even get to Banff it goes by so fast because it's so beautiful. 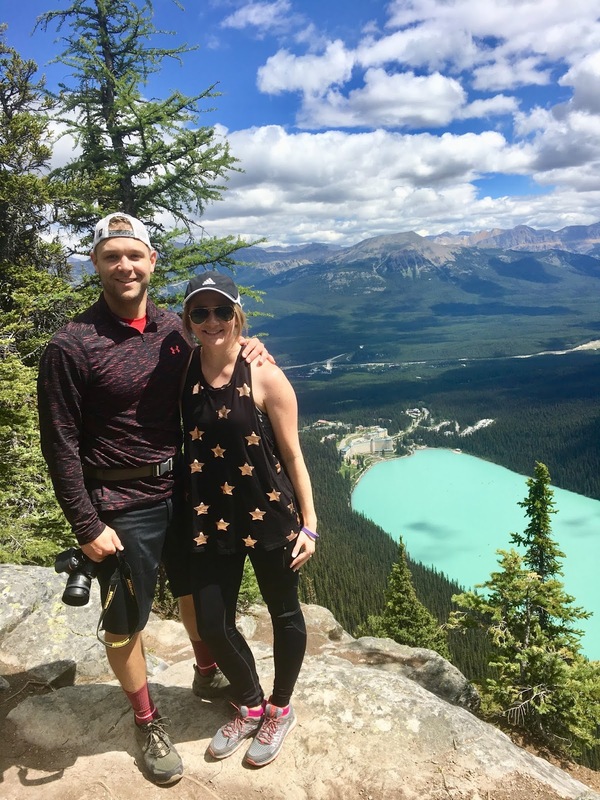 This time, we stopped at Peyto Lake which is another pretty blue lake! Follow the instructions on this blog post for amazing views of the lake that are away from the tourists and designated view point. It is worth the hike and where all of the pictures you see here are from! Our next stop on our drive was to Johnston Canyon. This was one of the busiest hikes we did the entire time we were there as it is really easy and basically paved all the way to the lower falls. At this point we were ready to get back to Calgary, so we only hiked to the lower falls, but if you keep going you can stop at either the upper falls and/or the inkpots. 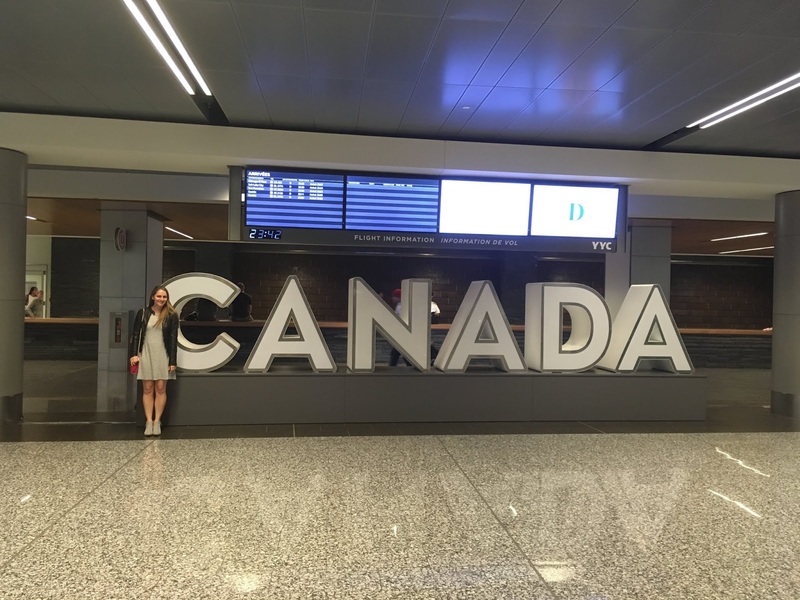 This night we stayed at the Best Western Downtown Calgary and went to dinner at Trolley 5. This was probably Tyler's favorite meal of the trip! We were there for Wing Wednesday and they had $0.25 wings! I'm not really a wing person but Tyler said this was a really good deal! On the day we were there it was their second birthday so they had a DJ, good drink specials, and free food/samples given out all night! It was so much fun and we actually ended up hanging out there for over 3 hours. If you find yourself in downtown Calgary, at least add it to your list for a drink because we both enjoyed the beer they made there! Day Nine: Day nine was our travel day and we did not want to come home. We were so sad to leave Canada behind and can't wait to go back one day! Questions? Leave me a comment or send me an email! 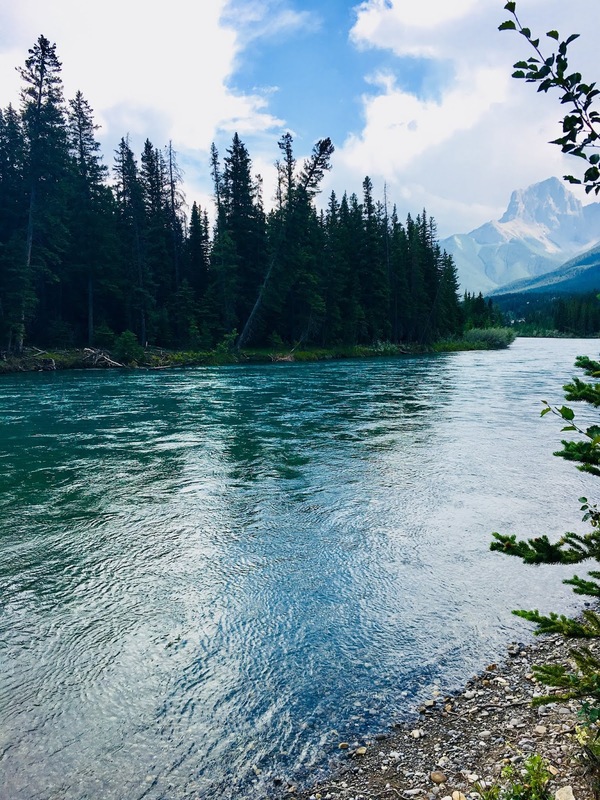 As I mentioned at the start of this post I will be writing another post all about our lessons learned from our trip to Banff. This post is already really text heavy and I have a lot more to share so all my tips can be found there! I will also be doing a post about what to pack for a trip to Banff. 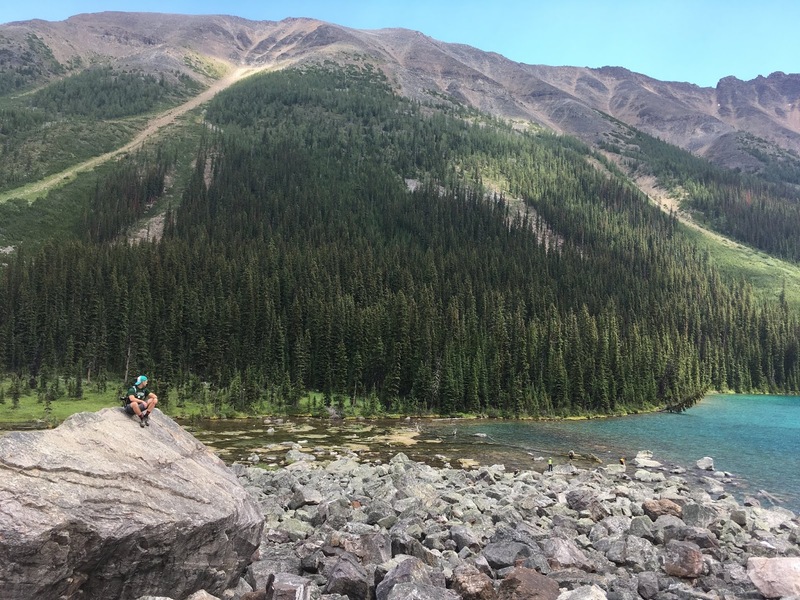 I may also write about if I think it's worth it to stop in Jasper (short answer: Yes) as I feel like not a lot of people add that to their trip. If there are any other topics you'd like to see covered about this trip let me know! !